Need-to-Know Pizza Info, Plus Behind the Scenes at HG! I'm obsessed with pizza -- especially on Friday nights. Is it possible to order delivery pizza that's relatively guilt-free? And do you have any finds or recipes that can be prepared in the time it takes to have pizza delivered? You're not alone in your obsession. Americans LOVE pizza! Here are some pizza tips for you... So fear not! Delivery DOs and DON'Ts - Go for thin crust instead of doughy and/or cheese-filled crusts. This will save you a lot of carby/cheesy calories. Request "light on the cheese" (or bravely try it cheese-free!). When it comes to toppings, order lots of fresh veggies, like peppers, onions, and mushrooms. But watch out for eggplant, which is often fried and/or oily. Skip the fatty meat toppings. If you want, keep a stash of turkey pepperoni in your fridge, and toss a few pieces on your pizza. And one of the best and most important tips for any delivery pizza... BLOT your pizza. Using a napkin to soak up some of that grease can save you a LOT of calories and fat grams. For some specific pizza-joint picks, check out this handy guide I created for Redbook. And click here for more ordering tips! Preheat-the-Oven Product Picks - There are tons of great freezer-aisle finds. If you have trouble with portion control (or just love the idea of consuming an entire pie without guilt! 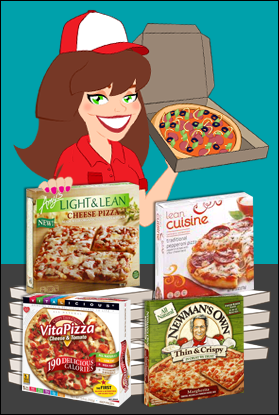 ), go for single-serve pizzas -- some of my favorites are from Amy's (especially Light & Lean! ), Lean Cuisine, Vitalicious (worth ordering online, if you can't find 'em! ), and Weight Watchers Smart Ones. For multi-serving pizzas, check out Kashi Thin Crust and Newman's Own Thin & Crispy. Great for a pizza night with pals! DIY in 30 Minutes or Less - Start with a guilt-free crust like a high-fiber pita, light English muffin, or high-fiber tortilla. You can even go veggie bottomed, using portabella mushroom caps or hollowed-out bell pepper halves. For sauce, either use jarred pizza sauce or mix your favorite spices/herbs into some canned crushed tomatoes. When it comes to cheese, light string cheese is a good way to keep portions in check -- you can shred it in a blender, or just pull it into strips and roughly chop. Reduced-fat Parmesan-style grated topping is another go-to ingredient. And for toppings, I love turkey pepperoni (Hormel's is the best), ground-beef-style soy crumbles (like the kind by MorningStar Farms or Boca), and chopped veggies. Check out Birds Eye Recipe Ready Pizza Supreme Blend -- pizza-perfect frozen veggies with black olives! 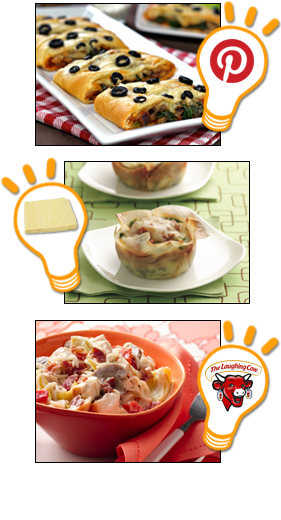 Quickie Recipes - For a low-carb fix, try the Deep-Dish Bell Pepper Pizzas, Mini Thin-Crust Pizzas, and our classic Pizza-bellas. For something unconventional, check out this Taco-Topped Pizza and this Thai-Oh-My Chicken Pizza Pie. And this Crispy White Pizza is a personal favorite. For LOADS more pizza recipes, picks, and tips 'n tricks, click here for our Edible Idol email, and click here for the "You Wanna Pizza Me?" episode page from the Hungry Girl TV show. Enjoy! I think your recipes are great! How do you come up with ideas, and what is your recipe-development process like? Thanks for the compliment! It's a LOT of fun creating Hungry Girl recipes. Inspiration is found EVERYWHERE! The HG team is always on the lookout for new menu items with crazy calorie counts -- we LOVE whipping up guilt-free swaps for our Chew The Right Thing emails. For these, we get our hands (and taste buds!) on the original, so we know exactly what we're re-creating. I also get a lot of ideas from the HG subscribers, who write in letting me know which fattening foods they crave. Keep 'em coming! Pinterest is another fun place to get our creative juices flowing. That's where we first came up with the ideas for our Stuffed-Apple Apple Pie and Super-Savory Calzone Danish. Sometimes recipe ideas come from my love of a particular product. For example, I'm crazy about wonton wrappers, and I knew they could wear a lot of hats (how cute is that mental image? ): pizza crusts, little lasagna noodles, crunchy cups... even taquitos! Sometimes I'll just pick a beloved food (grilled cheese! tacos! ), and then we'll run with it. Once a recipe concept is chosen, we turn to our favorite techniques (like faux-frying when re-creating a fatty fried food) and go-to ingredients (like The Laughing Cow Light cheese wedges for Alfredo-like sauces). Each and every recipe is tested in the amazing HG test kitchen. Some are nearly perfect on the first try, while others require a few takes to get 'em just right. And in case you're wondering, I am personally involved in every single HG recipe, whether it's created for our emails, cookbooks, or partners (like our pals at the US Potato Board). I make sure that every recipe is PERFECT. In fact, I'm off to taste a fruity scone right now... Look for that recipe in your inbox in early October! Who doesn't love pizza? Click "Send to a Friend" NOW, and send this pizza lovers' email to everyone you know! Today, September 25th, is National One-Hit Wonder Day. Celebrate by blasting Vanilla Ice's "Ice Ice Baby" while sipping on a Chilla in Vanilla Milkshake!